Editor’s note: Today’s post was written by Tom Szlucha, a volunteer docent here at the Museum. 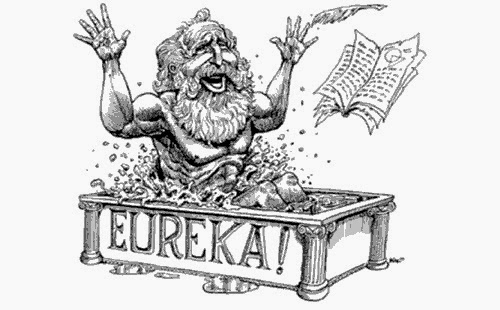 “EUREKA!” In his excitement, Archimedes runs down the street, naked and dripping wet from his bath. In this legend, he makes a discovery as he immerses himself in the bathtub and notices the water rise. It is this observation that leads to the solution to a problem that had been bothering him for some time.The king needs to know if the crown recently delivered by the goldsmith is pure gold or some cheap alloy — and Archimedes has found a way to determine what the crown’s made of! This example of scientific discovery is based on the very simple observation of the water being displaced as a mass is lowered into it. Archimedes is obviously very excited by his discovery (maybe a bit too excited). 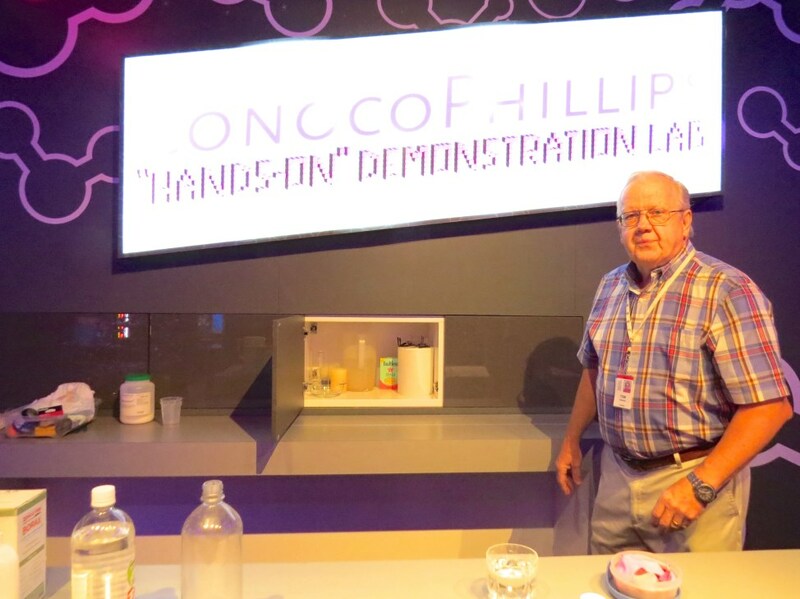 The ConocoPhillips “Hands-On” Demonstration Lab in the new Welch Hall of Chemistry stimulates this same sense of scientific discovery in visitors to HMNS (no bathtub for us though). 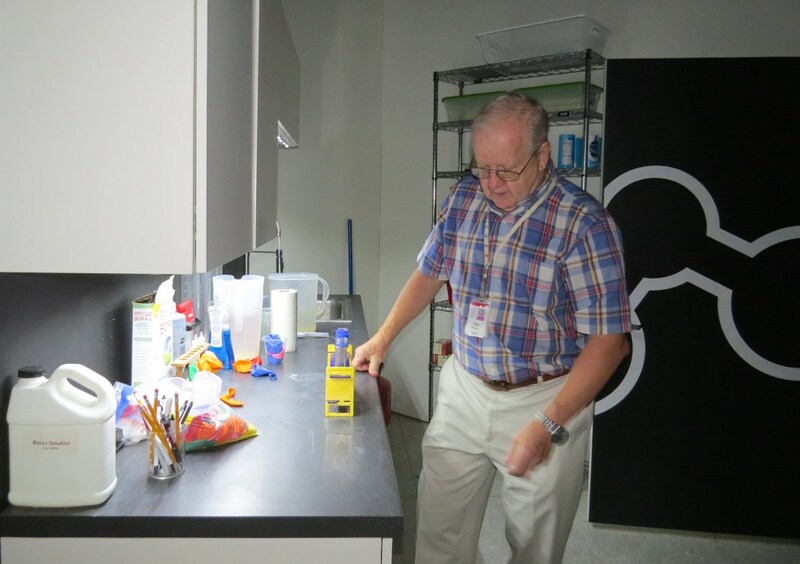 Chemistry docents conduct hands-on experiments in this lab — experiments that teach, inspire and, most of all, are fun. Now, back to Archimedes…According to the legend, he has to determine if the density of the metal in the crown is pure gold or a cheap alloy of gold. He develops a very simple experiment to see if a density difference exists between the crown and gold. He places the crown on one side of a balance beam. On the opposite side, he places gold until the scale is balanced. Then, he lowers the apparatus into a tub of water. If the balance tips to one side because the materials exhibit different buoyancy, then there is a difference in density — which would mean that a gold alloy was used to make the crown. The principles of density and buoyancy involved in the Archimedes experiment are included in many of our chemistry demonstrations. The demonstrations are given by a group of dedicated HMNS chemistry docents. They come from a variety of backgrounds: chemists, engineers, educators, college students, and others. They have the enjoyment of making these fun, simple, and safe demonstrations that teach and instill an interest in physical science. In return, they are rewarded for their time and effort by seeing children smile with excitement as they make their own “Eureka!” discoveries. The theater area for these demonstrations is new and improved, a literal “step up” from the work cart that used to be parked in the old Chemistry Hall on the first floor. Downstairs, the new theater has a raised stage with large worktables in front and behind the presenter, allowing for multiple experimental setups. There are pass-through cabinets behind the rear table that facilitate the movement of materials from the preparation and a storage room located behind the stage. The audience is seated on rows of black, rubber-coated cubes under the illumination of air molecules hanging from the ceiling. These molecules are different colors, proportionally representing the mixture of nitrogen, oxygen, and trace gases in the Earth’s atmosphere. The suspended molecules make a perfect transition into experiments associated with gases. The demonstration area is enhanced with a well-tuned wireless sound system, making the presenter easily heard by the seated audience. There are a variety of experiments performed here, most using simple household materials. Almost every school kid knows how to make a “volcanic eruption” by mixing baking soda with vinegar. But did you know that this acid/base reaction is endothermic, meaning that it absorbs energy, thus creating a cooling effect? A product of this chemical reaction is carbon dioxide gas. Since carbon dioxide is denser (i.e., heavier) than air, it can be poured to extinguish a flame. This stunt can come off as a magic trick—there is no liquid involved as you pour the invisible gas and extinguish the candle flame. Other practical lessons are taught through simple experiments, answering questions such as why do we wash our hands with soap; how do scientists measure the strength of acids and bases; and what does a baby diaper have in common with Jell-O? Chemistry docents have plenty of opportunities to interact with the audience by soliciting help with these experiments. Participants learn about material density when they make hard-boiled eggs float on salt water and sink in plain water. They help show that Diet Coke is less dense than regular Coke. But why? The explanation is somewhat shocking. The average twelve-ounce can of sugar-sweetened soda contains about forty grams of refined sugar. That’s about three heaping tablespoons of sugar! 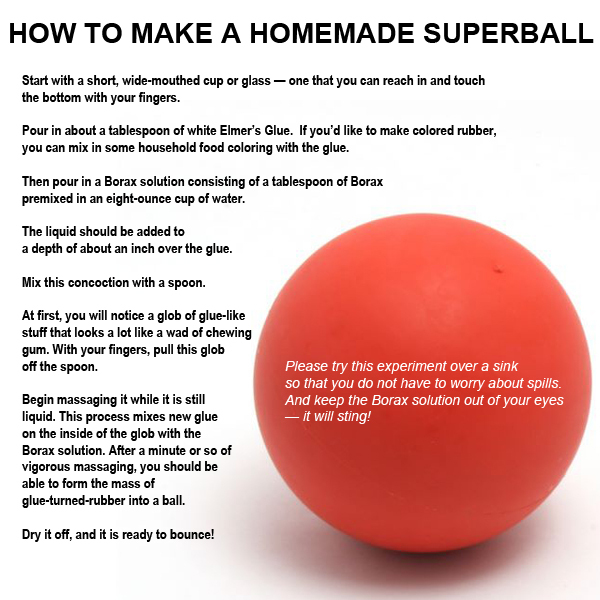 Participants also make a rubber “Superball” out of white glue and a simple ingredient found in the laundry isle of the grocery store. This polymerization process utilizes the boron atom in Twenty Mule Team Borax to cross-link the chains of polymers found in casein-based white glue. 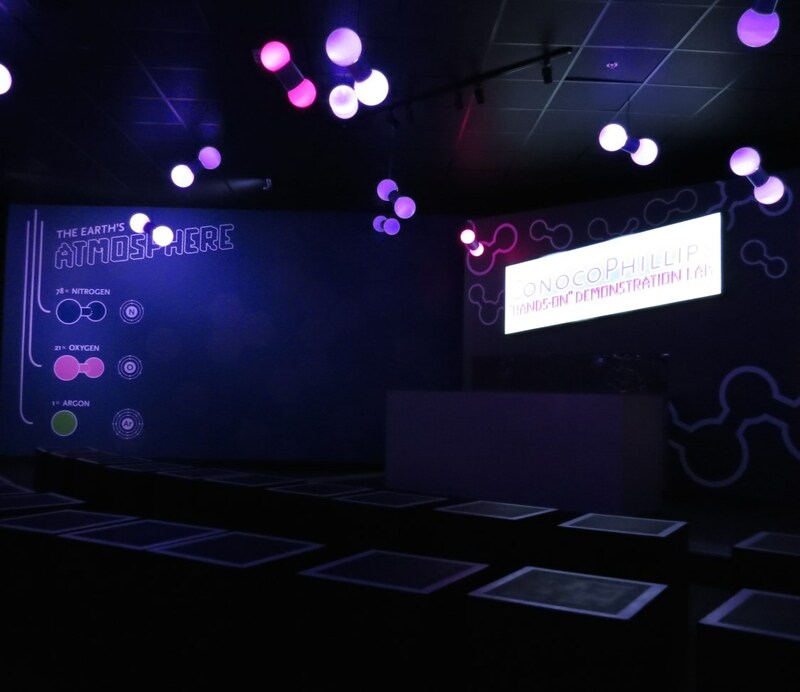 This experiment helps to teach visitors about some of the characteristics of polymers. Audiences entertained at the ConocoPhillips Hands-On Chemistry Demonstration Lab range from large school groups to families and individuals spending the day at the museum. The demonstrator has to be somewhat flexible, modifying their routine for the audience that is present. Having multiple tables with large surfaces allows for a number of different experiments to be set up and ready to go. Some experiments may be more suited to a particular age group, so the presenter can pick and choose, thus customizing each show to the specific audience. If you are interested in joining in the fun by becoming an HMNS volunteer, please visit the HMNS web site to learn more or fill out the short registration form by clicking here. The Volunteer Office will invite you to come to the museum for a short “get-acquainted” interview and will provide information about upcoming orientation programs. You don’t need to be an expert already, just interested in science! Our fun and comprehensive program will teach you everything you need to know to feel confident working with visitors and students in the HMNS exhibition halls. You’ll get to meet smart and interesting people, learn about a variety of scientific subjects, and become an integral part of one of the nation’s most-visited museums! We look forward to meeting you soon! Next Post Seeing Stars with James Wooten: The Perseids are back August 12!